Draft Beer Kegerator T-Tower - Stainless Steel - 2 Faucets. Stainless steel box with 3-inch diameter round stainless steel column and flange. Double tap allows you to serve two beers from the same tower. Faucet knobs are not included. Constructed of timeless, durable stainless steel with brushed satin finish. Double tap set up allows you to serve 2 beers at once. Tower box dimensions: 9W x 5D x 4H. 2 beer lines with hex nuts. 2 chrome plated brass faucets with brass levers. For other Bar Accessories, Draft Beer Equipment, Restaurant Supplies and much more! 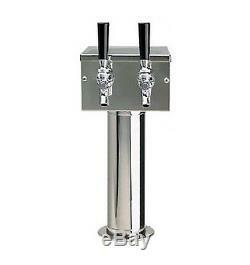 The item "Stainless Steel 2 Tap Draft Beer Kegerator T-Tower Commercial / Home Bar Equip" is in sale since Thursday, April 25, 2013. This item is in the category "Business & Industrial\Restaurant & Food Service\Bar & Beverage Equipment\Draft Beer Dispensing\Draft Beer Towers & Faucets".